NABSQNO 13S-235924-3862355. 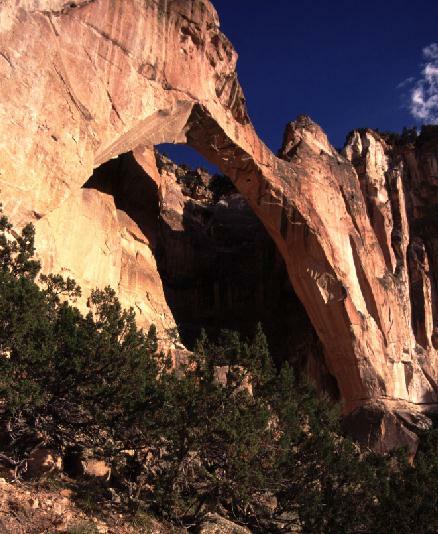 La Ventana is an adult alcove natural arch eroded through Dakota sandstone. The arch is well separated from the cliff that occludes it. Indeed, some might consider it to be old because of this, but the opening is still fully occluded. La Ventana has a span of 135 feet and a height of 80 feet. It is the second longest arch in New Mexico. It was listed in the Vreeland catalog as number 17-12. La Ventana is located in the Cebolla Wilderness section of the El Malpais National Conservation Area just east of El Malpais National Monument in Cibola County, New Mexico. Access is via a short hiking trail that leads under the arch from a parking area just off of highway 117. There are several arches in this vicinity, some visible from the highway, some requiring short hikes. Check at the El Malpais ranger station on 117, about 8 miles south of exit 89 on I40, for information and access restrictions. Note that the USGS North Pasture (NM) Topo Map shows this arch at an incorrect location about two thirds of a mile east of the actual location.